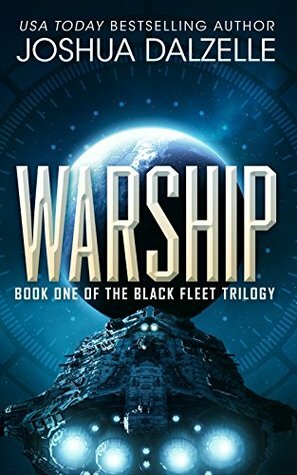 Warship by Joshua Dalzelle is the first book in a series called the Black Fleet Trilogy. A jaded captain of an ageing destroyer class starship and a crew with only a grudging respect for him is in port while the starship undergoes necessary maintenance. While in port, the captain is assigned a new executive officer, who he feels is probably only there to oust him from his position. Before all of the maintenance work can be carried out, the captain is handed orders to get the starship under way. He is understandably annoyed, as not only has the time been cut short to ensure the new starship updates are working, but also that he has been ordered to transport a bureaucrat. He’s the captain of a destroyer class starship, not a ferry vessel! After a slow build up, the action really gets going, and it’s definitely worth persevering with the story. As the crew go about their mission, they encounter an alien craft that is far more powerful then their own. So powerful is the new alien technology that it soon becomes clear that they are facing not only their own mortality, but that of the entire human race!